There are few nations that treat a sport with as much reverence as Brazil treats soccer, or as it is known globally, football. To many, it is simply the greatest rallying point in society. And so, in 2014, the eyes of the world turned to Brazil to watch the twentieth iteration of the FIFA World Cup. While the event was watched the world over, there existed a story behind the crowds, the story of the natives of Brazil that the culture seems to have forgotten. With recent attention being placed on Qatar and the rights of workers being violated, it is worth noting, that the infringement of the rights of people is not unprecedented in a host nation. In 2007, Brazil succeeded in its attempt to be named the host of the 2014 FIFA World Cup and began setting in motion, its development plans for the event. Their bid to host to FIFA declared that seven new facilities would be created and five existing stadiums would be renovated to meet the new standards for the competition (FIFA). One such renovated stadium was the Maracanã, the crown jewel of Brazil’s football history. It was created in preparation for the 1950 World Cup, where it hosted the Opening game and the Final, in which Brazil lost to Uruguay 2-1 (FIFA). In 2009, Rio De Janeiro was selected to host the 2016 Summer Olympics making the need for quality facilities near the city even higher (FIFA). Since it’s debut in the cup, Maracanã had been used as a multipurpose facility, but the area around the stadium had fallen into disrepair. Before some of the urban decay had settled in, some of the unused buildings in the district around the stadium were claimed as community resources. One building in particular became the official museum for the Indigenous Peoples of Brazil, the first of its kind in a major city (Daibert). But by 1977, the building was abandoned and the museum was no longer operational. 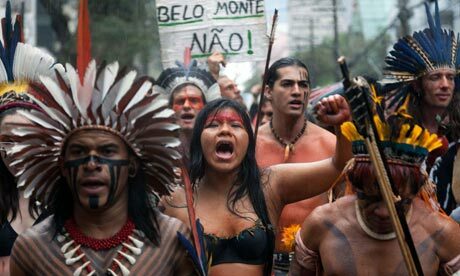 However, this did not stop the native peoples of Brazil from using the space. Members of over 17 indigenous tribes began to reside in the area around the stadium and in the no-longer running museum. The surrounding areas became known as the “Marcana Village” and eventually became home to over 70 natives (Daibert). It served as an informal community shelter for displaced indigenous tribes-peoples until government targeted the areas surrounding the Maracanã stadium for necessary renovation to meet FIFA demands. 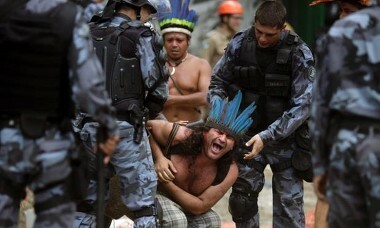 In March of 2013, police forces surrounded the “Maracanã Village” and negotiators were sent in to evict the tribes-peoples from the buildings. For many, the village had been the only place they had ever called home and were unwilling to move. The negotiators told the natives that they would be relocated to a new government built facility, however, at the time, the facility was not yet built. In fact, construction on the relocation site had halted due to a lack of funds from the government (Froio). Unwilling to wait any longer, armed police stormed the compound with riot gear and tear gas. The violence was not only directed at the indigenous people in the camps, but rather anyone that was there to support the natives in their protest against removal. Eventually, all of the squatters were removed from the building and with the area cleared, it was immediately burned down. The space eventually went on to become a parking lot and a new stadium dedicated to the history of football in Brazil. The displaced natives were forced from their homes and given nowhere to go. FUNAI or Fundação Nacional do Índio, Brazil’s protection agency for the natives and their culture began working with the government to secure places for the displaced to turn to with little effect (Froio). And, the damage was already done. The Maracanã Village was destroyed, and in its place was the new expansion of the stadium.